In today’s world, it seems as if there is a solution for everything. We got tired of hailing cabs and waiting on the curb so we created Uber. We got tired of shopping for our groceries, so we downloaded InstaCart on ours phones and had someone do it for us. In the real estate industry, things were the same way for a long time and agents were stuck waiting for their commissions until closing day. Now agents have the option to receive their commission before closing with a real estate commission advance. Thankfully, our never-ending quest for convenience has come to the real estate industry. Agents are no longer stuck waiting for their closing day to receive the commissions for their sale. Instead, now you can partner with a company like Zen Commissions and receive your funds before closing! 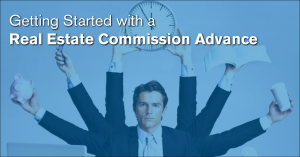 Why get started with a real estate commission advance? A commission advance is where you, the agent, sell a portion of their pending commission at a discount in exchange for immediate funding. These are not loans, but a service that allows agents to monetize their real estate transactions without waiting until closing. Imagine running your business with stable cash-flow always at hand. It is possible with Zen Commissions! Our commission advances competitively position your business for sustained growth enabling you to cover expenses on time, every time. Think taking a commission advance will break the bank? Think again. With Zen Commissions, we advance your commissions to you at a 4.99% discount. Saving you hundreds, if not thousands, at closing compared to our competitors. In Austin, Texas alone there are 15,000 real estate agents all competing for a limited client pool. Just like any other business, marketing is a key factor in your business’ success! Marketing makes the phone ring, brings you new clients, sells your client’s homes fast, and ultimately brings you the coveted ‘closing’. These days, agents have to keep up with digital marketing, print marketing, referral marketing and all other types of outreach. As they stack up, these tasks and services can bring hefty expenses to your business. Choosing to advance your pending commissions can keep you on top of your marketing campaigns and your business in great standing in the public eye. Another great aspect of a real estate commission advance from Zen Commissions is our quick approval process. From start to finish, receiving your advance takes no more than a day and can be as quick as an hour until the money is deposited in your bank account! Maybe you have bad credit. Well, we have good news! Zen provides real estate commission advances to agents nationwide without checking your credit or financial history. The only thing you need to receive up to $15,000 before closing is have a pending real estate transaction. Ready to receive get started with Zen Commissions and get funded? Apply for a commission advance today!